AMC’s ‘Mad Men’ is headed to Hawaii for a secret two-day shoot for the season 6 premiere episode. 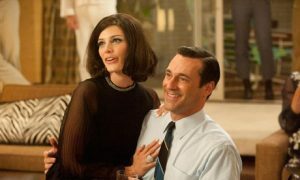 According to Deadline, it will only involve the actors Jon Hamm and Jessica Pare (Don Draper and wife). They were joined by a small tv crew to shoot the scenes. We know that series creator Matthew Weiner and executive producer Scott Hornbacher were scouting locations in Hawaii in September. But why the short shoot and why the small crew. I know Weiner likes to not give things away, but with the season 5 ending scene, where we see Draper alone at a bar as he is approached by a woman, I am left to think he might be going back to his old ways. Could this Hawaii scene be a scene with a new girl, or his wife and kids, or could it be a dream sequence? I guess we will have to wait. However, if you are shooting in Hawaii, why in the hell didn’t somebody on the crew or at AMC, force Weiner somehow to get Christina Hendricks out there in a bikini. And yes the image below is actually Christina Hendricks in a bikini. This entry was posted on Wednesday, October 17th, 2012 at 10:35 pm	and is filed under News, Television. You can follow any responses to this entry through the RSS 2.0 feed. You can skip to the end and leave a response. Pinging is currently not allowed. « Hollywood Takes Aim At Animal Poachers With Two New Films!! !